Please note: This rod is the only rod magnet that is diametrally magnetised. This means that these rods will not lay endways on each other, but rather sideways, like fish sticks. This allows for interesting experiments, but is rather unusual in everyday life. All other rods in our assortment are axially magnetised - such as the identical S-04-10-AN, which you should use to hang up photos, for instance. A customer sent us this link to a video: https://www.youtube.com/watch?v=Pf3z935R37E. 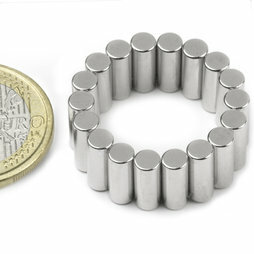 The size of the magnets in the video might not be exactly the same as our magnet, but you can see nicely the magnetic properties of a diametral magnetisation. The diametrally magnetised rods cling to each other sideways.